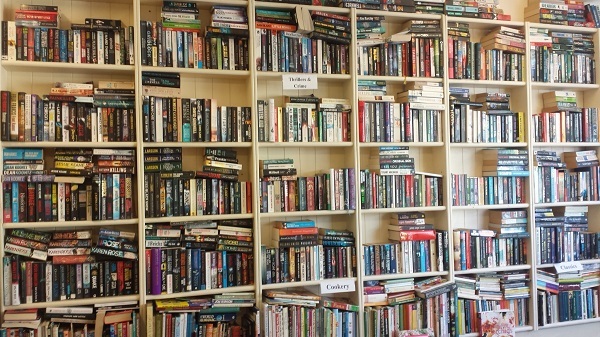 Locals and visitors alike are spoiled in Cashel when it comes to choice regarding preloved items of clothing, books, cds, bric a brac and more. The great thing about these shops is that, not only are the charities that they represent generating much needed income for very worthy causes, they are also preventing the dumping of unwanted clothes, books etc. into waste bins and ultimately ending up in landfill sites. Massive amounts of resources are used making clothes and half of all clothing gets chucked away within a year of manufacture. You can read more about the environmental cost of creating clothes by clicking here. 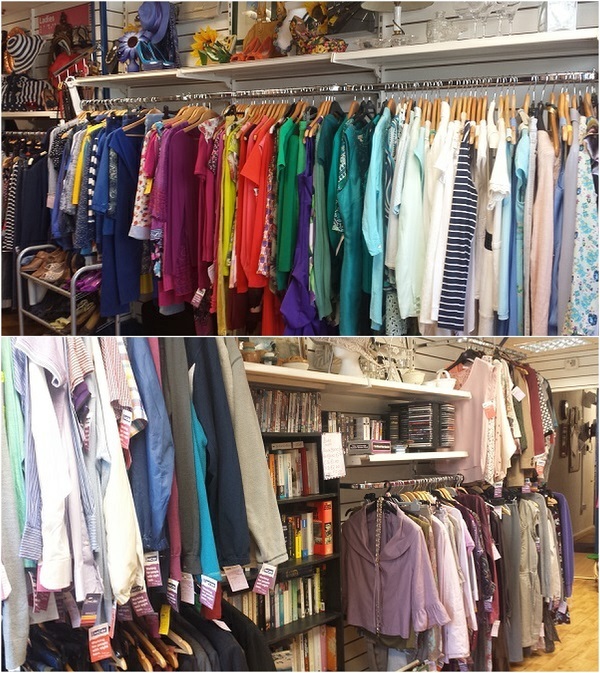 There are currently three used clothing shops and one used bookshop in Cashel. I took a little tour of them all recently and took a few photos to help share the word and encourage people to visit. Lets start up Friar St. and work our way down along Main St. 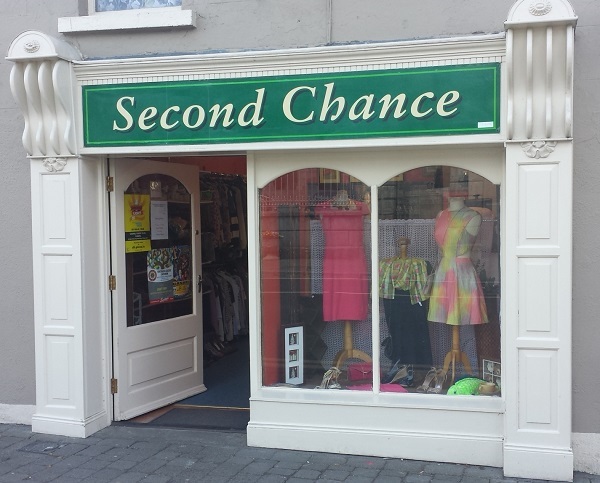 The first shop on our mini tour is Second Chance located on Friar St. across the road from the Church. Second Chance is run by Cashel and District Social Services. 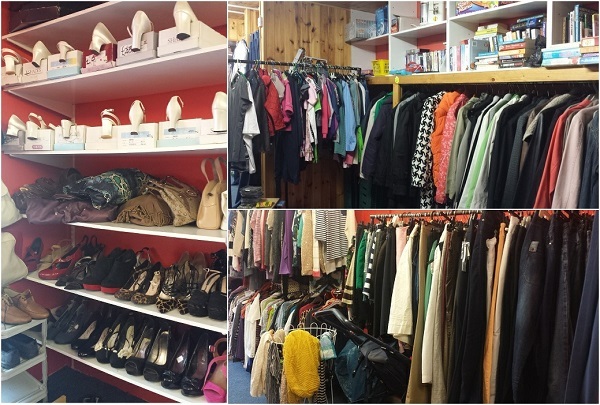 It is open 6 days a week and all donations are welcome from clothes, bric a brac and small furniture. Cashel and District Social Services operate the local ‘Meals on Wheels’ service 3 days a week. As part of the ‘Meals on Wheels’ service, they avail of the Foodcloud app to collect surplus food that has reached it’s ‘use by date’ from supermarkets that would otherwise go to waste. Foodcloud has seen over 12 million meals redistributed in Ireland and the UK. Cashel and District Social Services work with St Vincent de Paul to distribute food to families in the Cashel and Rosegreen district. Cashel and District Social Services also run a used furniture sale at St. Vincent de Paul House on John St., Cashel once a month. Keep an eye on our Zero Waste Cashel Facebook page for details of future sales. They also run the Tuck Shop in St Patrick’s Hospital which is staffed by CE participants and volunteers and also provide monitored alarms for the elderly. As you can see there’s quite a bit going on and all support you give helps their services, saves waste and saves you money. 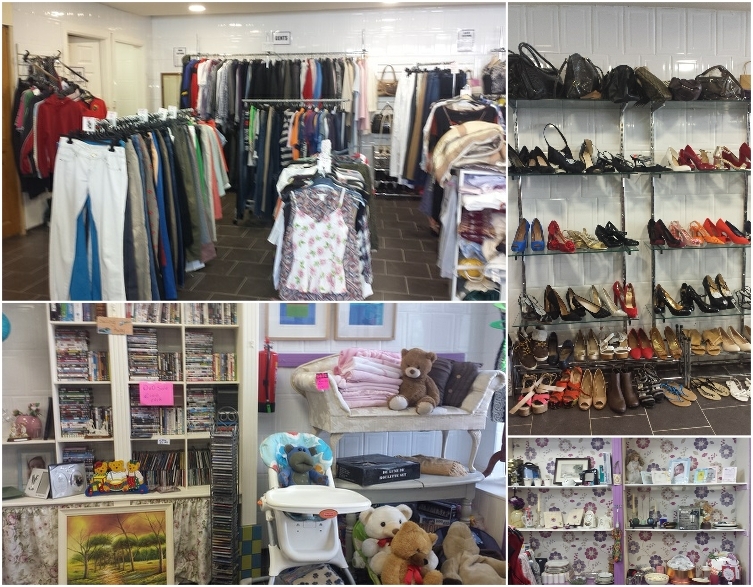 Selection of clothing and footwear at Second Chance, Friar St. Cashel. There’s a good selection of wedding shoes, which most likely have not had a lot of usage. 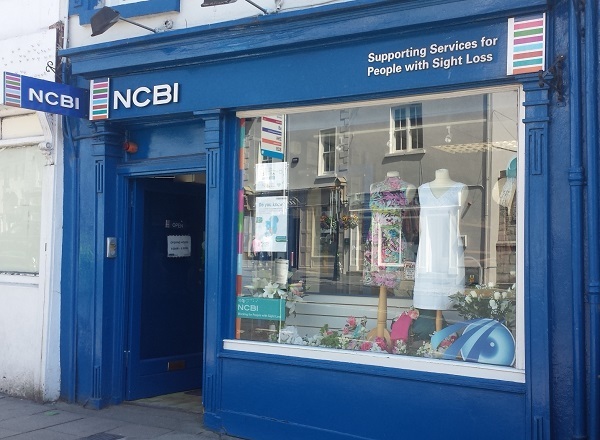 The NCBI shop on Main St. has a great range of clothing for all tastes along with accessories such as hats and belts etc. NCBI (National Council for the Blind Ireland) is the national sight loss agency. 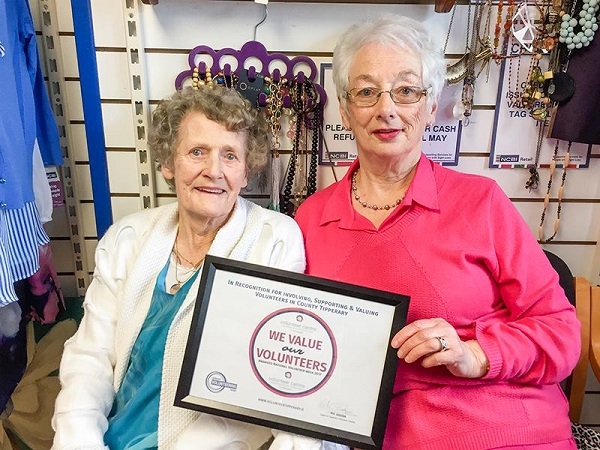 They are a not for profit charity, which offers support and services to people of all ages who are experiencing difficulties with their eyesight. 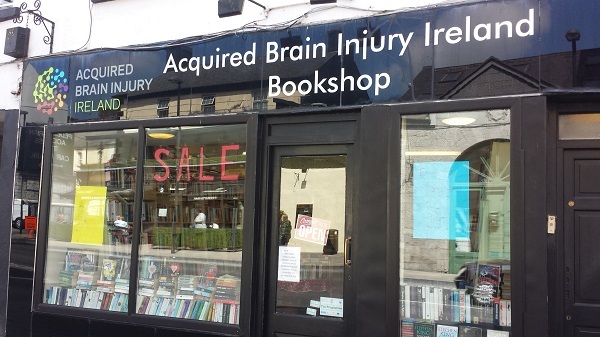 The Acquired Brain Injury Ireland Bookshop has a vast collection of used books with something for everyone and all ages. There are great bargains to be had when you buy a bundle of books. 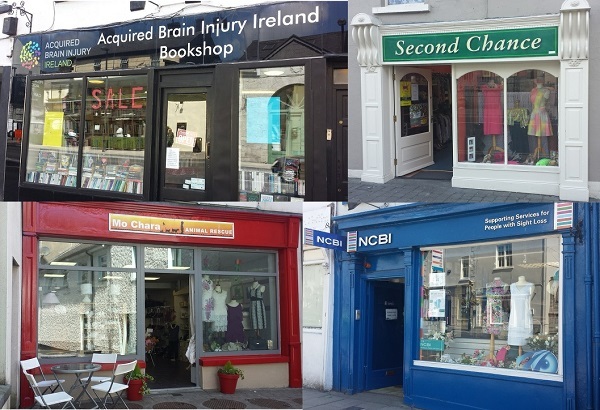 Acquired Brain Injury Ireland (ABI Ireland) is Irelands leading provider of community based neuro-rehabilitation services for people who have acquired a brain injury in Ireland. Founded in 2000 as the Peter Bradley foundation, ABI Ireland enables people between the ages of 18 and 65 with an acquired brain injury to live an independent life by providing them with a supportive living environment. 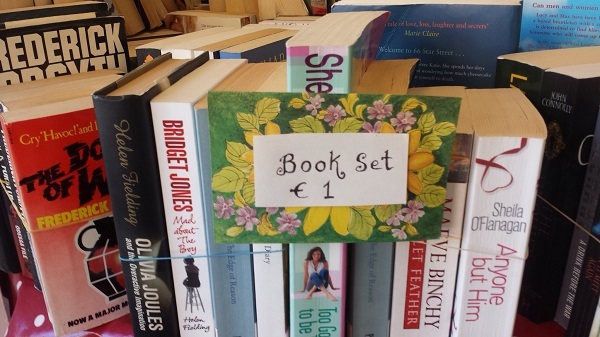 Books Galore at the Acquired Brain Injury Ireland Bookshop Cashel. 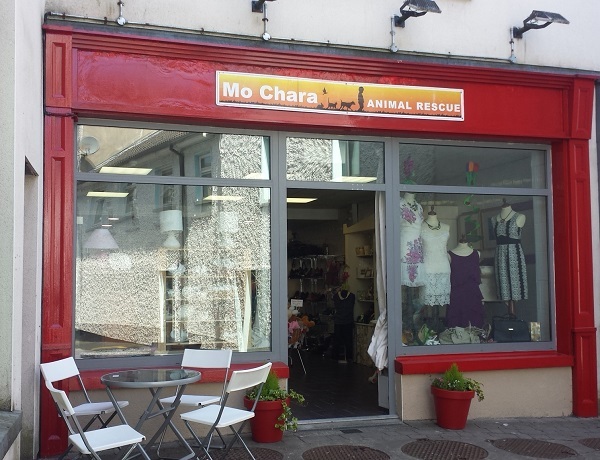 The last shop on our little tour is the newest one, Mo Chara Animal Rescue Shop, which opened during the Spring and is located at Wesley Square (close to SuperValu). 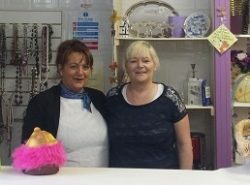 Mo Chara Animal Rescue Shop is the new kid on the block, so to speak. The new kid has settled in nicely and has a great selection of clothing, footwear, small furniture, nursery items and bric a brac in the newly renovated, bright and spacious shop. Mo Chara Animal Rescue, take in and provide care for mis-treated, neglected, abandoned and straying animals. Following rehabilitation and/or attempts to reunite animals with their owners, they rehome the animals in their care into loving, carefully vetted homes. All cats and dogs rehomed by them are vaccinated, treated against parasites, microchipped and neutered (unless they are too young to do so at the time). There is plenty of choice for shoppers in Cashel to buy top quality clothing and goods from these reputable shops which have new stock arriving regularly. All these shops also gratefully accept any donations of good quality items you may not need anymore. A special shoutout must also go to the wonderful staff and volunteers who ensure the smooth running of these shops. Tipperary Volunteer Centre do a great job in helping find volunteers for local charities and offering advice and assistance. So the next time you are considering going shopping, be sure to pop in for a visit to any or all of these wonderful shops in Cashel. You’ll be pleasantly surprised at the great bargains that are on offer!